I had a ton of basil in the fridge and wanted to see if I could lighten up my recipe just a little bit more. By cutting back just a kiss on the oil, cheese, and nuts I was able to make my original recipe even lighter without sacrificing any flavor! Pesto is full of nutritious ingredients like; basil, garlic, pine nuts and extra virgin olive oil, but when all is said and done, if I can find a way to lighten up a recipe without sacrificing flavor I’m all in! I found that by adding in the broth not only do you save yourself some excess calories, but it makes the pesto creamier (there’s no oil pooling at the top of your pesto), plus it’s easier to spread and coats pasta more evenly. And don’t worry, since you’re not eliminating the olive oil all together, the pesto still benefits from the fruity, richness that the olive oil brings. Now the question becomes, “What shall I do with my pesto this week?”. 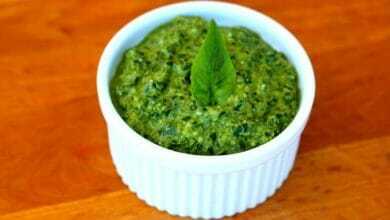 What do you like to make with pesto? Pulse garlic in food processor until finely minced. Add pine nuts and pulse again. Add basil and pulse until finely chopped (you may want to do this in batches). With processor running, slowly add the olive oil and chicken broth, you're looking for a nice creamy consistency. Stir in the cheese and season with some salt...enjoy! *Recipes tend to change just a little every time you make them. Add oil and broth slowly... you may need a little more or a little less. **If you plan to freeze you're pesto, hold off on adding the cheese (it doesn't do so well in the freezer). Simply add it in whenever you are ready to use you're pesto. Good for you, Dani – I’m with you on lightening up when stuff is just unnecessarily heavy or even, with pesto, often gree-zy. Alanna – I couldn’t agree more! What a great idea. It makes sense! Thanks for the tip. Katie – Thanks for stopping by! Steamy Kitchen – I used to do more oil as well, but I’m telling ya, the broth is GREAT! I love this tip — almost like that traditional Italian method of adding pasta water to the sauce! I love pesto tossed with pasta. I love that this is lower fat. Thanks! I make it without the tomato, and often use wheatberries for the grain. I love the combination of grain, corn and pesto. Thanks for sharing the recipe! I made a little pesto/brown rice/tomato mix for my daughter and she LOVED it! Great recipe Dani! I always add spinach to my pesto to add a little more veggies in it for the little ones but I will have to add broth next time. Great way to lighten it up!! Can’t wait to try. I like to mix in some broccoli and grilled shrimp then toss with whole wheat rotini. I see you also cut back on the cheese which is also not a bad idea. I’ll try the lighter version next time. Love your recipe idea… simple, yummy, and nutritious… my kind of food! As for the cheese… I didn’t even miss it. Besides… if you do, you can always add an extra sprinkle to the top of your dish! Thanks for the recipe! The lighter pesto will go well in my tuna fish sandwiches. Thanks! I noted that you made a comment about freezing pesto….how? I have a LOT basil growing out back and I’m going to need to do something with it and this looks great. Laura – you can do this several ways… you can use ice cube tray a make little pesto cubes. Once they freeze pop them into a bag and use as needed. You can also do this with a mini muffin pan for slightly larger portions. Super convenient way to spruce up a busy weeknight meal! I have so much basil in my garden I always look for inventive ways to use it. My latest : pesto mixed with avocado sprinkled with pomegranate. A delicious quick treat on toasted Arabic bread. This is a great idea that I will be trying. Dani…what type of food processor do you use? I have a Wolfgang Puck big model but haven’t used it to make pesto yet. Thanks. Thanks so much for this recipe! I can’t wait to try it! I never would have thought to use broth in place of some of the oil. One of our favorite quick dinners is to take Trader Joe’s Lemon Pappardeli and toss it with pesto, baby spinach and sauteed shrimp along with a little pasta water. I just put the spinach in the colander I’ll be draining the pasta into and that’s enough to wilt it without overcooking it. hey Dani, thank you so much for the recipe. Does vegetable broth work as well for vegetarians?